Confidence is a prized trait in both the personal and professional world and something I get to work with people on a daily basis. But what is it and how can you improve it? Read on for some tips. 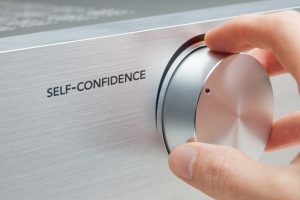 The first thing to mention is that confidence is about an ability to be able do something, it’s external focused as opposed to self esteem, which is internal and based on your thoughts or opinion of yourself. Write it down – this helps you to see if it’s what you really want, makes it real and allows you to adjust it if it isn’t. Write what you want, not what you don’t want. Apparently the brain can’t process ‘Not’ or ‘Don’t’, and you will think about or visualise the negative and then make that happen as Derren Brown shows in the link. Break down the steps into manageable chunks. Learn from the past, what’s gone wrong before or stopped you from speaking up? What can you do differently this time so you get a new or different outcome?